The cost of a water-storage project Fort Collins has been pursuing for more than a decade continues to float higher and higher. But even at its current estimated cost of $74.1 million — $27.3 million more than estimated just a few years ago — city officials say expanding Halligan Reservoir along the North Fork of the Poudre River remains the city’s best and most affordable option for securing future water supplies that would be needed in the event of drought. That’s a big-ticket item by any measure. The cost would be covered by reserves in a fund that gets money from water rates paid by Fort Collins Utilities customers and fees charged to developers for tapping into the city’s water system. Part of the reason for the project’s rising cost estimates is the uncertainty that comes with going through the National Environmental Policy Act process. The current projected cost includes $16.3 million in contingency funds to cover potential surprises in federal and state requirements for permitting and mitigation. Fort Collins has been working on and paying for an Environmental Impact Statement, or EIS, for the proposed expansion of Halligan for 12 years. The latest estimate for when a draft EIS for the project will be released by the U.S. Army Corps of Engineers is April 2019, said Adam Jokerst, the city’s project manager. Construction costs have gone up over the years and continue to rise. If the project is permitted, construction on the expansion, estimated to cost $31.3 million, could begin in 2023 and be completed in two years. The Halligan project has faced a lot of issues over the years. For a time, the EIS process included the city of Greeley’s proposal to expand its Milton Seaman Reservoir, which also is on the North Fork of the Poudre. Greeley wanted to expand its 5,000-acre-foot reservoir to 53,000 acre-feet. 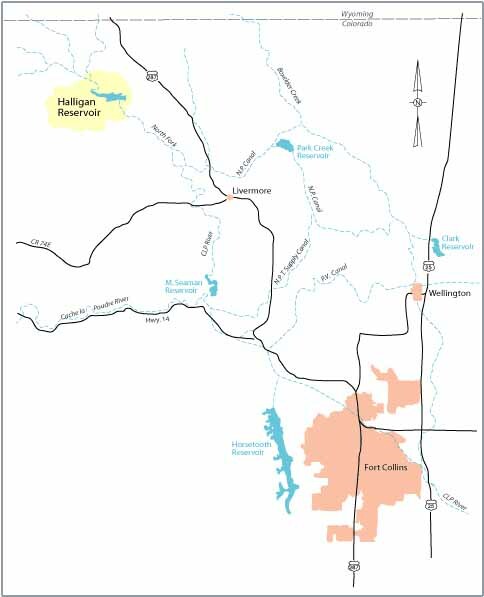 The Halligan-Seaman project included the cities in partnership with North Poudre as well as the Fort Collins-Loveland, East Larimer County and North Weld County water districts, also known as the Tri-Districts. The Tri-Districts backed out of the project in 2009, citing mounting costs and a lack of progress on environmental studies. North Poudre withdrew in 2014 over the same concerns. Those withdrawals required scaling back the project, changing its environmental impacts and adding time to the review process, Jokerst said. There’s also been a lot of turnover at the Corps over the years with personnel overseeing the EIS. The Seaman project was separated from Halligan in 2015 because of changing scopes for the projects and differing time frames. Greeley is now proposing to expand Seaman to 88,000 acre-feet to meet its water supply needs to 2065, according to the Corps’ website. Fort Collins officials maintain the Halligan project still makes sense for the city even with its escalating costs. It makes use of an existing reservoir and could potentially improve flows on the North Fork through mitigation. The city has the water rights it needs to fill the reservoir, Jokerst said. And Halligan is still less expensive than other water supply sources, according to the city. The going rates for an acre-foot of firm yield from the Colorado-Big Thompson project is $60,000. Under current estimates, water from the Halligan project would cost $8,800 per acre-foot. So far, Fort Collins Utilities has spent $12.6 million on the project. The city has appropriated $37.4 million for it and would have to come up with another $36.7 million under current projections. • The NISP/Glade project — The Northern Integrated Supply Project is a proposed water storage and distribution project that will supply 15 Northern Front Range water partners with 40,000 acre-feet of new, reliable water supplies. 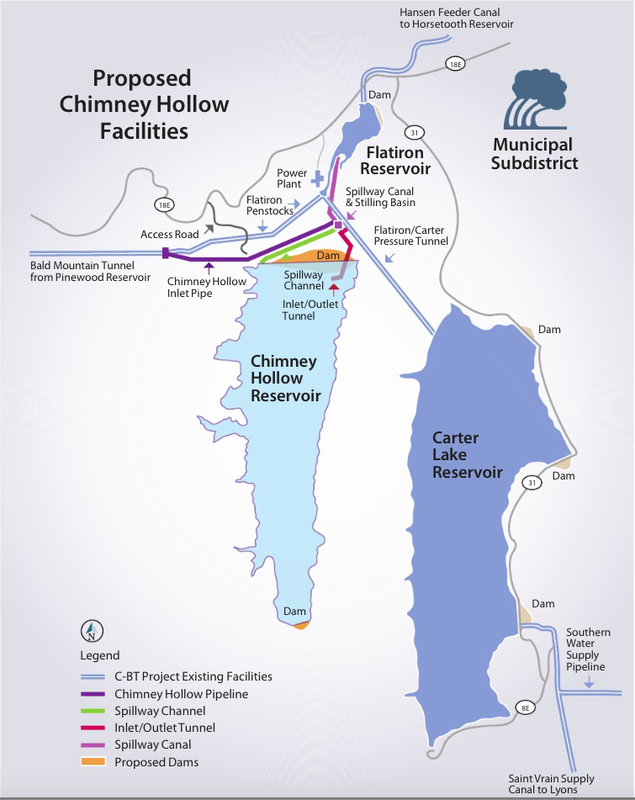 • Chimney Hollow Reservoir — A 360-foot high dam that will hold 90,000 acre feet to help supply the thirsty Thompson Valley urban area. The water will come from the Windy Gap Project, a diversion dam and pumping station completed in 1985 to provide extra irrigation and municipal water out of the Colorado River. The water originally was stored in Grand Lake, but when that is full, the water cannot be stored. Chimney Hollow, also known as the Windy Gap Firming Project, solves that problem. • Halligan reservoir enlargements — Halligan Reservoir near Fort Collins is about 100 years old. Its capacity is about 6,400 acre feet of water and the City of Fort Collins wants to add 8,125 acre feet to the reservoir by raising its dam about 25 feet. • Milton Seaman Reservoir enlargement — Greeley originally had wanted to expand Seaman Reservoir in conjunction with Halligan, but because of diverging goals Greeley withdrew from the joint project. The expansion of Seamon now is targeted for design in 2028 and construction by 2030. • Gross Reservoir enlargement — Gross Reservoir is one of 11 reservoirs supplying water to the City of Denver and surrounding urban areas. It is on the city’s Moffat System, which diverts water from the Western Slope to the metro area. 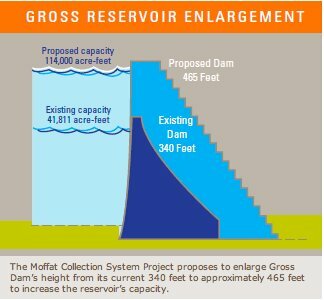 Denver Water has proposed raising the dam height by 131 feet, which will allow the capacity of the reservoir to increase by 77,000 acre feet. 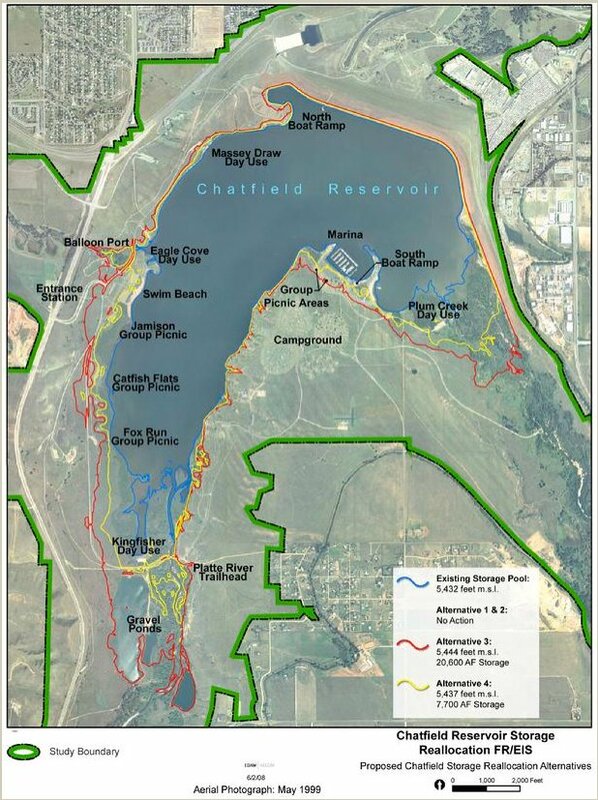 • Chatfield Reallocation Plan — The U.S. Army Corps of Engineers has determined that Chatfield Reservoir, built primarily for flood control after the 1965 South Platte River flood, can accommodate an additional 20,600 acre feet of water storage for water supply without compromising its flood control function. This additional storage space will be used by municipal and agricultural water providers to help meet the diverse needs of the state. No actual construction is required, but the legal, environmental, and engineering concerns of allowing the reservoir to hold more water all have to be satisfied. 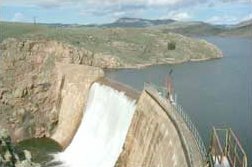 City officials say additional water-quality studies required by federal and state agencies are likely to delay release of a draft Environmental Impact Statement, or EIS, for the proposed Halligan Reservoir expansion until 2017. The document was expected to be released this year. The studies are expected to cost about $475,000 on top of the $8.2 million already spent as part of the environmental review process, said Adam Jokerst, water resources engineer with Fort Collins Utilities. Halligan Reservoir is on the North Fork of the Poudre River northwest of Fort Collins. The expansion project would more than double the capacity of the reservoir. The project is entering the 10th year of an EIS process that’s being overseen by the U.S. Army Corps of Engineers. The highly detailed water-quality studies will include monitoring water temperatures along the North Fork and main stem of the Poudre from below Halligan past Fort Collins, Jokerst said. “It’s quite an effort,” he said. Aquatic life is sensitive to water temperature, he said. Some types of fish cannot thrive if temperatures are too warm or too cold. Methodology used in the studies will be consistent with that used to analyze the impact of other water storage projects proposed along the river, including the controversial Northern Integrated Supply Project, or NISP, which would build Glade Reservoir north of Fort Collins. The need for the more research was raised by various entities and the public through comments directed to the Corps regarding the draft supplemental Environmental Impact Statement for NISP, Jokerst said. The Halligan EIS process is being directed by the Corps, the Environmental Protection Agency and the state health department, Jokerst said. The Halligan project “makes a lot of sense” for the city, Jokerst said. It makes use of an existing reservoir and could potentially improve flows along the North Fork of the Poudre. Fort Collins is located in a semi-arid region where the amount of water available from month to month and year to year varies, especially during dry years and drought. Fort Collins Utilities has a responsibility to provide an adequate supply of water to existing and future customers; we made long-term water supply an essential element of our planning efforts decades ago. •Establishing water conservation programs beginning in the late 1970s. Recent updates to the Water Supply and Demand Management Policy, which provides direction to meet our community’s future water demands, identified the need for additional long-term water storage. Though the community actively conserves water year-round, storage is a valuable tool in water resources planning. Adequate storage helps meet projected demands and provides reserves for unexpected events, including pipeline failure, fires in the watershed or issues with Horsetooth Reservoir. This policy also references Utilities’ Water Conservation Plan, which lays out a significant expansion of the water conservation program and targets residential and commercial customers, as well as indoor and outdoor water use. Water conservation helps ensure the wise use of available water, especially during dry, hot summer months when little moisture is available. Although conservation helps stretch our water supply, Utilities’ current limited storage capacity means conserved water cannot be stored for future use. If the Halligan Water Supply Project is permitted by the U.S. Army Corps of Engineers and approved by City Council, it will help meet Fort Collins’ future water needs. Careful planning and analysis determined that enlarging Halligan Reservoir is one of the most cost-effective solutions that minimizes environmental impacts compared to constructing a new one. The project also will provide storage of mostly existing water rights and be tailored in size and operations for our specific needs. Fort Collins Utilities is proud of its strong conservation ethic, which provides a solid foundation for the management of our current and future water use in the Poudre River Basin. Through continued conservation efforts, smart water management and additional storage capacity, such as the Halligan Water Supply Project, Utilities will be prepared to meet the future water needs of our community. For more information, visit http://fcgov.com/halligan. An environmental review of the proposed expansion of a Fort Collins reservoir is moving forward with its separation from a Greeley water project. The U.S. Army Corps of Engineers plans to consider the city’s proposal to more than double the storage capacity of Halligan Reservoir as a separate project rather than in combination with Greeley’s proposal to enlarge its Seaman Reservoir. Both reservoirs are on the North Fork of the Poudre River. The projects have been combined under the Corps’ review process since 2006, when the cities formally proposed enlarging the reservoirs to meet future water demand. The projects were combined because their operations were expected to be coordinated in order to impact on the river as little as possible, said Donnie Dustin, water resources manager with Fort Collins Utilities. As part of the environmental impact statement, or EIS, process required by federal regulations, alternatives to the proposed expansions must be considered by the Corps. Fort Collins has its alternatives lined up and ready while Greeley needs more time to develop its alternatives, Dustin said. A draft EIS for the Halligan is expected to be released in spring 2016, Dustin said. The city’s current request is to add 8,125 acre feet to the reservoir by raising its dam about 25 feet, Dustin said. Fort Collins has requested the expansion to shore up its water supply to protect against drought. The city needs the increased storage capacity “now,” Dustin said. Greeley does not plan to expand Seaman Reservoir for several years. “Just given where we are right now, it just didn’t make sense to stay together,” he said. The Halligan-Seaman project initially included the cities in partnership with the North Poudre Irrigation Co. as well as the Fort Collins-Loveland, East Larimer County and North Weld County water districts, also know as the Tri-Districts. The water providers proposed expanding Halligan by 40,000 acre feet. The Tri-Districts withdrew from the project in 2009 citing mounting costs and a lack or progress on the environmental studies. North Poudre withdrew in 2014 for the over the same concerns. So far, costs related to the permitting process have reached $7.7 million, with Fort Collins paying about $4.5 million, officials said. More Cache la Poudre River coverage here. …the modern struggle over Glade Reservoir — which would divert Poudre water into a lake larger than Horsetooth Reservoir — might not inspire a musket-bearing militia, it could cost hundreds of millions of dollars, and has already sparked two complex environmental studies and angered Poudre River advocates. Glade Reservoir may be just a plan on paper, but some say it is key to keeping Northern Colorado from drying up in the next few decades. Others contend that the highly controversial reservoir will damage the Poudre, not to mention swallow up acres of land, displace a federal highway and transfigure northern Larimer County’s landscape. But release of a long-awaited environmental study that could pave the way for construction of two new Northern Colorado reservoirs — including Glade — has been postponed until next spring. The delay is the latest stall in an already yearslong battle over expanding Colorado’s water storage. “We need this project and we need it soon,” said Carl Brouwer, who has been spear-heading the reservoir project, known as the Northern Integrated Supply Project, for the Northern Colorado Water Conservancy District. “We need this project today.”..
Now, the study won’t be released until possibly spring 2015, said Northern Water spokesman Brian Werner. That means the plan that would add millions of gallons to Northern Colorado’s reservoirs to stave off inevitable water loss remains years from realization. Meanwhile, Front Range cities are forced to lease water rights from agriculture in order to make up for water shortages, which continue to grow each year. The U.S. Army Corps of Engineers has been studying the environmental impacts of the Northern Integrated Supply Project, or NISP, for more than a decade and, in 2008, began a second study into the project after public outcry demanded it. The supplemental study has now taken more time to complete than the first draft released in 2008. But the future of NISP is not entirely dependent on the results of that study — the project is tied to the fates of several other proposed reservoirs in Northern Colorado, all of which are snarled in years of environmental study. The Army Corps would not confirm that it had officially changed the deadline for the next environmental impact statement but said it is “continuing to work through a deliberative process on the NISP schedule,” said spokeswoman Maggie Oldham. Regardless, the way forward for NISP will not be simple, as the project’s success depends on the approval of two other potential reservoirs, Halligan and Seaman, both still years away from realization, said Reagan Waskom, director of the Colorado Water Institute. Northern Water has also yet to acquire all the land necessary to build Glade Reservoir, which would also require the relocation of 7 miles of U.S. Highway 287 north of Fort Collins. But all other elements needed to pull NISP together still await approval from the U.S. Army Corps of Engineers. Waskom thinks delays on the NISP study can be explained by the complex overlapping of the two water storage projects and a series of staggered deadlines for each. “You can see why they are having trouble,” he said Tuesday. But while the Corps grapples with balancing decisions on NISP and another reservoir project, the gap between Colorado’s water availability and water use continues to grow, said Waskom. While Brouwer believes he can see the light at the end of the proverbial tunnel for Glade, there are myriad obstacles that stand between the project and completion. In addition to years of environmental studies and public comment, Wockner has vowed to prevent the construction of Glade at any cost by invoking the public right to challenge Army Corps decisions in court. All these things have kept Glade and NISP wrapped up in years of controversy, to the point that proponents of the project have joked they will never see it completed in their lifetime. But Colorado might not have a lifetime to wait for more water, according to draft versions of the Colorado Water Plan completed this summer. The state is on track to be short 500,000 acre-feet of water by 2050 — enough to cover half a million football fields in one foot of water. The Fort Collins-Loveland Water Conservation District has already passed its water shortage date: By 2005, the district was short 1,100 acre-feet of water, an amount that could grow to 7,500 acre-feet by 2050, according to the Army Corps of Engineers. The NISP project is projected to bring an extra 40,000 acre feet of water to Northern Colorado, to satisfy shortages in cities from Fort Collins to Fort Morgan. 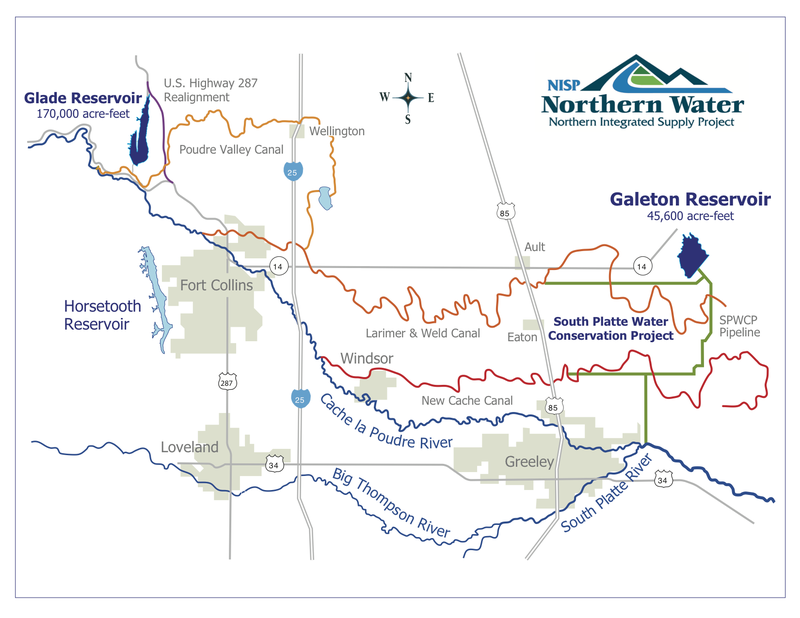 The Northern Integrated Supply Project, of which Glade is a part, is just one of a few solutions offered by the in drafts of the state water plan for the South Platte River Basin, the most populous in the state. While Northern Water can’t begin work until the Army Corps finishes the supplemental study the project remains in limbo. “We have our good days and our bad days, in terms of ‘is this ever going to end,’ ” said Werner. The supplemental environmental study will not be an end to the NISP process, but instead just another step in many years’ worth of approvals and studies, not to mention potential court challenges from groups such as Wockner’s. Thanks to a 1980s purchase, Northern Water owns roughly 75 percent of the land needed to build Glade, but the district has yet to acquire land from Colorado State University, the U.S. Forest Service and the Bureau of Land Management, said Werner. The cost of that land acquisition is unknown, Werner said. But the entire project has been given an estimated price tag of $490 million. Meanwhile, the inevitability of greater water shortages looms. An executive order from Gov. John Hickenlooper required that the state start preparing a state water plan to reconcile water conflicts between the Western Slope and the Front Range, as well as plan for the next several decades. But that plan, the first draft of which is due to the governor by Dec. 10, will also be subject to a year of public comment. In Fort Collins, which has been experiencing water shortages for almost 10 years, the gap between water needs and availability will grow steadily every year unless something is done. “The gap only grows if the projects don’t get built,” said Waskom. Plans for two new reservoirs in northern Colorado are facing more delays as a key federal review is not expected until next spring. The delay is the most recent turn in a long battle over expanding Colorado water resources. The release of a long-awaited environmental study that could pave the way for construction of the two new reservoirs could be postponed until next spring, according to advocates and opponents. The plan by the Northern Colorado Conservancy District to build Glade and Galeton reservoirs in northern Colorado was supposed to take a step forward this winter with the release of a second environmental impact statement. The statement has been postponed twice. The reservoirs are part of North Colorado Water’s Northern Integrated Supply Project to create 40,000 acre-feet of new supplies. The Army Corps of Engineers has been studying the environmental impacts of the NISP for more than a decade. In addition to the two reservoirs, the project calls for two pump plants, pipelines and improvements to an existing canal, according to a Northern Water summary. Northern Water distributes water to portions of eight counties in northern Colorado and a population of 860,000 people. In 2008, the corps began the second study into the project after public outcry demanded it. The supplemental study has now taken more time to complete than the first draft, released in 2008. The Corps of Engineers said it is reviewing the schedule for the new report, but no official date has been set. The study will not end the process, but instead is just another step in the approvals, studies and potential court challenges. More Northern Integrated Supply Project coverage here.